The roots of the National Marine Aquarium in Plymouth go back over 100 years. Building the largest Aquarium in the UK, was the idea of the Plymouth based Marine Biological Association (MBA) . This prestigious marine biology research institute, located just around the corner from the National Marine Aquarium on the Hoe, had offered a small public aquarium for over 100 years. However, MBA scientists had a vision to establish a purpose built, national class aquarium in their city that that would help to ’to promote a sympathetic understanding of our oceans to the public’. 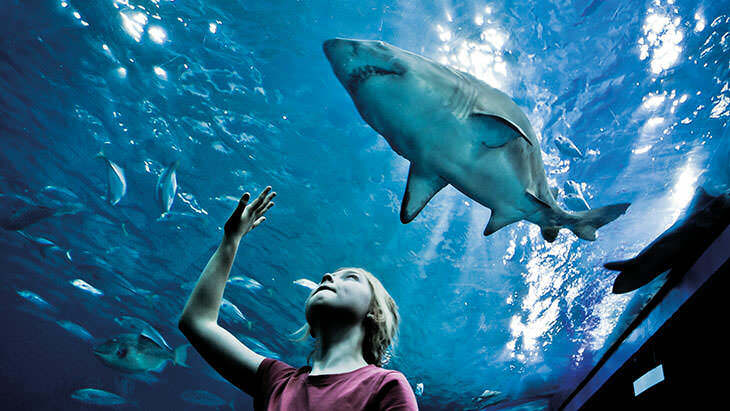 From this idea, the National Marine Aquarium was born and opened its doors to the public for the first time in 1998. The Aquarium is built on reclaimed land, owned by Sutton Harbour and a mixture of lottery money, donations and private funding was used for the initial build. Now the Aquarium operates on funds raised almost entirely by ticket sales along with some grant funding from European sources or the Heritage Lottery fund. Since opening, we have been a separate charitable entity to the MBA, but we remain firmly committed to disseminating the fantastic research of the MBA to our visitors and can regularly be found sharing ideas and project work across the boardroom table or at the bar in The Fishermans Arms! There is a lot more to be done regarding raising awareness on marine conservation issues, so there are exciting times ahead for the Aquarium. We’re really pleased to see recent changes in the law regarding micro-beads, a reduction of sharks being caught for their fins and a reduction of plastic bag use in the UK by 6 billion plastic bags per year! These are all issues we have highlighted to our visitors, so we owe a big thank you to them for listening and to you for reading about us.